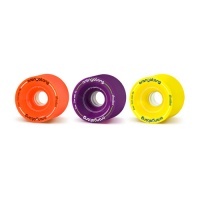 Longboard Wheels from Orangatang, Cult, GFH and Lush Longboards. We only sell wheels used and preferred by our team and local riders. Whether you want a stiff duro, downhill bomber wheels or something you can slide straight "out of the box" we have the right wheels for you! 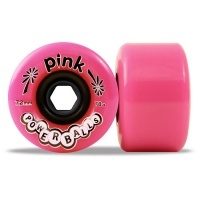 Awesome Pink Powerballs 72mm wheels from Abec11 are great all round riding wheels and if you like pink then they are right up your street! 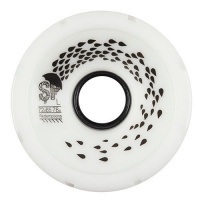 Classic Retro Freeride Wheels from Abec11 72mm and just silky smooth in the slide. Fast predictable and smooth is the best description we have had! 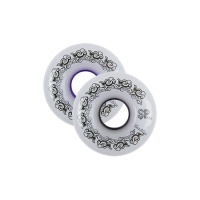 The Cult Cebrium wheels are the Centre Set bearing version of the Cult Classic wheels. Superb for freeride and now flippable to make them last even longer. Designed to close the gap between longboarding and mountainboarding, these wheels will enable your longboard ta tackle any off road terrain. 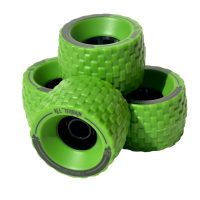 Designed to close the gap between longboarding and mountainboarding, these wheels will enable your longboard to tackle any off road terrain. The Orangatang 4President wheels offer a traditional grip with soft lips and square edges. Offset bearing and 70mm size make them ideal for most, the softer 80a and 83a are the most popular. The biggest and baddest release from Orangatang. Diamond 3D Face for weight reduction. Featuring the same core as the Kegal, this strong and light wheel is super squidgy. The big boy freeride wheels are the Orangatang Durians sitting in at 75mm and offset bearing with pre worn in outside they are ready to ride out of the gate. 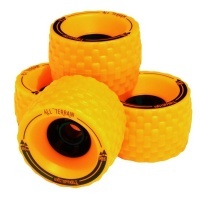 The small 65mm Fat Free Orangatang wheels are great for urban riding and tricks especially in the harder compounds. 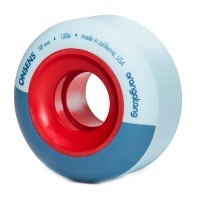 The In Heat 75mm Orangatang longboard wheels are the big size fast moving wheels with great grip and ride. 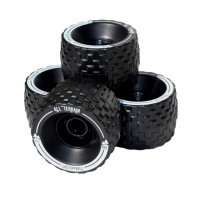 Ideal for longer distance and racing style the offset and soft lips are great. Moronga wheels are fantastic. Suiting the needs of a diverse group of riders. Yellow for freestyle, Purple or Orange for Freeride at whatever speed tickles your fancy. 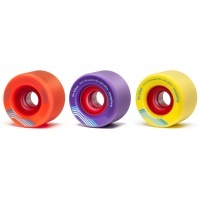 From the guys and gals at Loaded Longboards the Orangatang Stimulus are a super versatile 70mm longboard wheel. 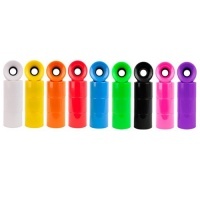 These fit the vast majority of boards we sell. Orangatang "The Cage" are the tall centerset freeride wheels. 73mm diameter and 50mm contact patch and flipable to even out the slide wear. The smaller 66m Keanu Orangatang centre set freeride wheel is ideal for smaller boards wanting agility and able to flip the wheels for equalising wear. The Orangatang Kilmer 69mm centre set bearing freeride wheels are an awesome wheel for many people. Good balance of size and flipable to equalise wear when sliding. 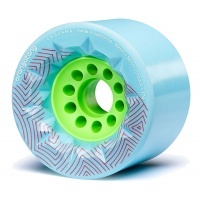 Santa Cruz Slime Balls 66's 78A Skateboard Wheels Neon Green 66mm.Slime Balls are back! The Cirrus comes in a 78a 83a and an 86a Durometer. More grip and a cloudy opaque colour sends these wheels above and beyond expectations. The Momentum is the fast freeride wheels or no paws wheel. They have a large contact patch and mould release finish which gives it more hook up and stopping power. The Redemptions our the Brand new rain wheels for when the going gets wet. With vertical cuts and grooves these wheels are specifically designed for those classic British wet days. The smallest of the Slide Perfect range. The stratus comes in a 78a and an 83a Durometer. More grip and a cloudy opaque colour sends these wheels above and beyond expectations. The Supremacy Wheels are middle ground for any freeride. With all 3 duros options in this shape to really give a lot of choice dependent on your style. Slide or Stick, the Supremacy have you covered. Be the king of your local park. The Orangatang Onsen park wheels continue to blend the boundaries of traditional skateboarding, park riding, and longboarding.